Add this issue to your photographic library for information on the Canon EOS 5DS, 5DS R, 750D, 760D and M3 and EF 11-24mm f4L USM lens. Plus techniques on converting to digital, making time-lapse movies, choosing lenses for portraiture and using Magic Lantern. Details of Canon's spring cashback. Check to see if there is an update for your camera and the benefits and fixes offered. 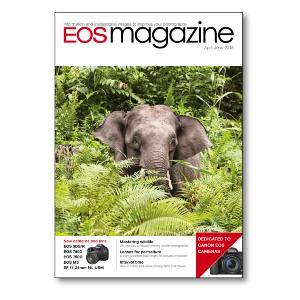 Richard Garvey-Williams talks about how best to capture wildlife with your EOS camera. Full details of the EOS 5DS, 5DS R, 750D, 760D, M3 and EF 11-24mm f4L USM lens. Winning images from our forum photo competition. An expanding programme of events at our training centre in Tackley, Oxfordshire. We answer your photographic questions. A complete overview of EOS cameras, current lenses and accessories. A review of EOS magazine forum threads. Stand back, slow down and become an impressionist with your EOS camera. We look at various ways to convert your slides and negatives to digital files. We show you how to combine a sequence of images into a time-lapse movie. Attractive floral images with the help of a microwave. Is there a perfect lens for portraits? We look at all the options to help you decide. How good is the third party software that gives you more features on your EOS camera? As for many of us, photography is part and parcel of Miles Willis' travels abroad.